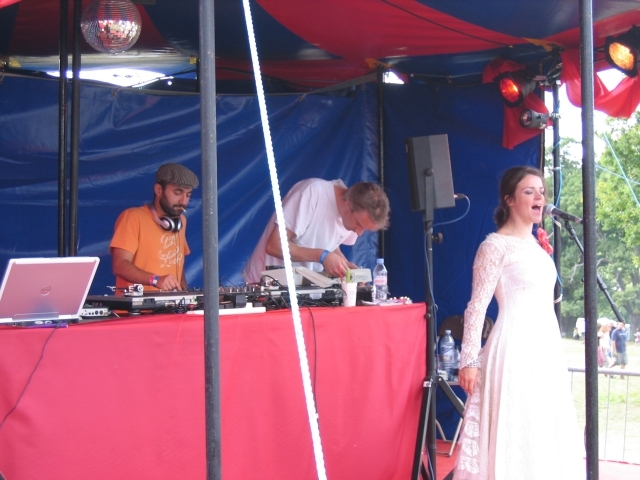 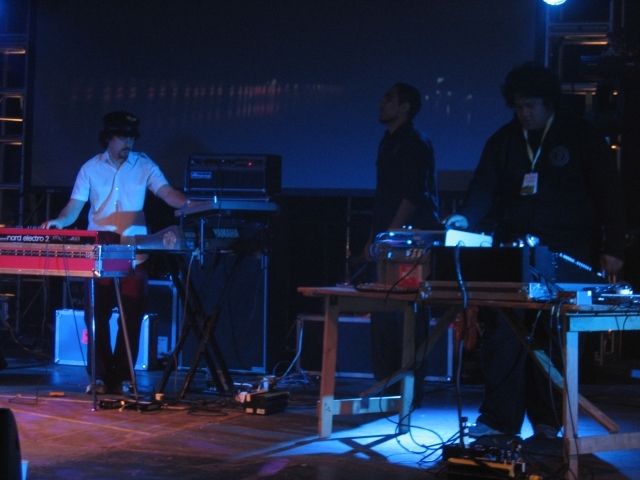 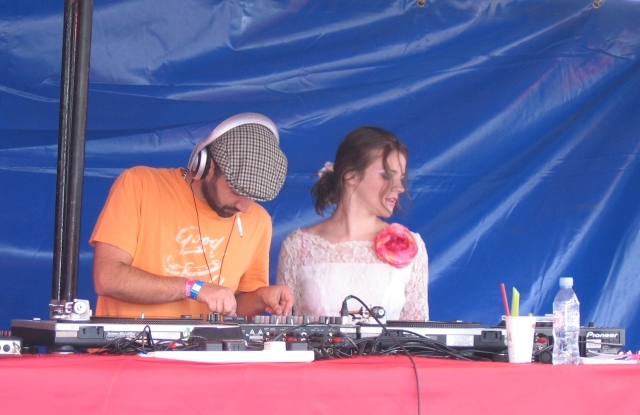 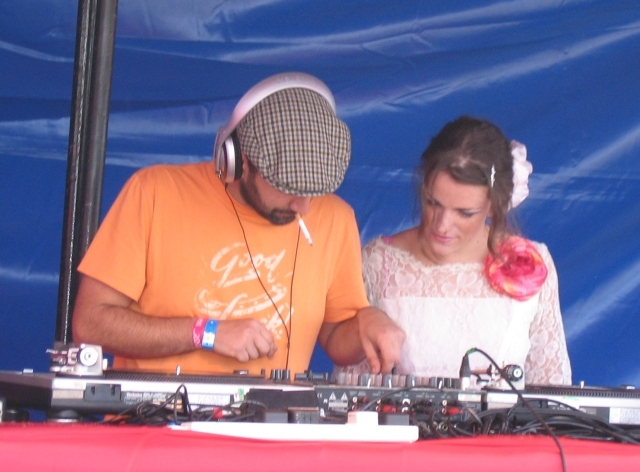 Rui Teimao and Rosa Fernandez of Boomclick (performing as the Boomclick Soundsystem) at the Finlandia Bar. 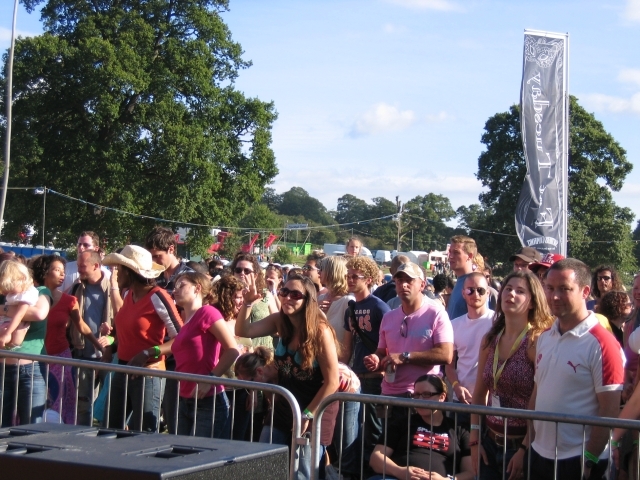 Audience adjacent to the stage at the Finlandia Bar. 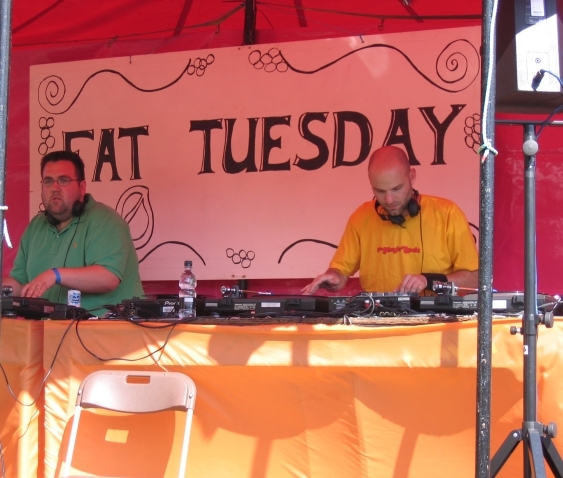 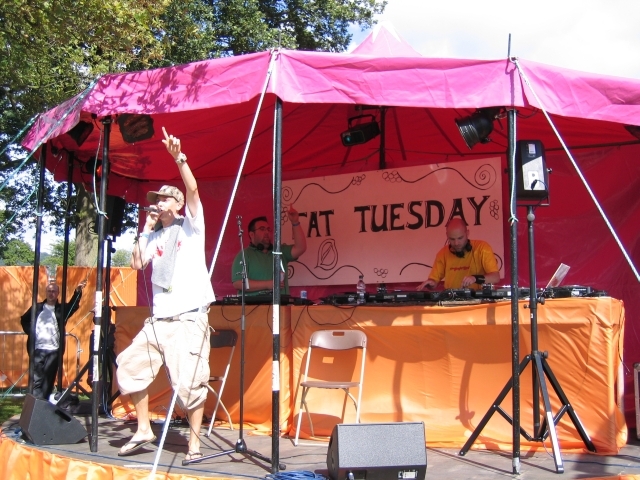 The Nextmen DJing with MC Wrec at the Fat Tuesday Bar. 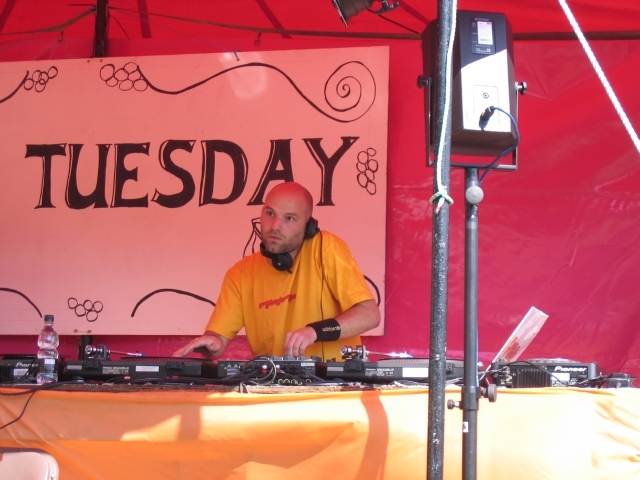 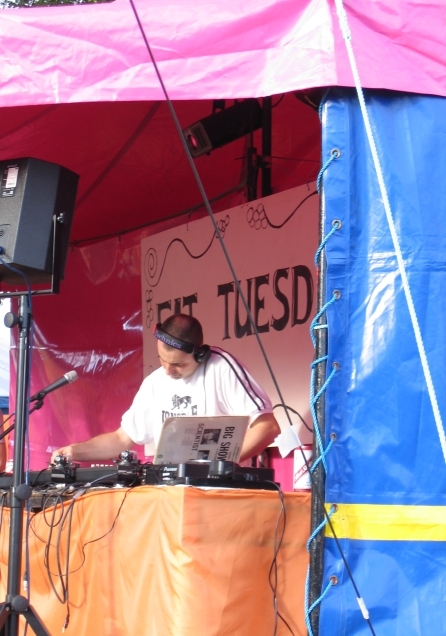 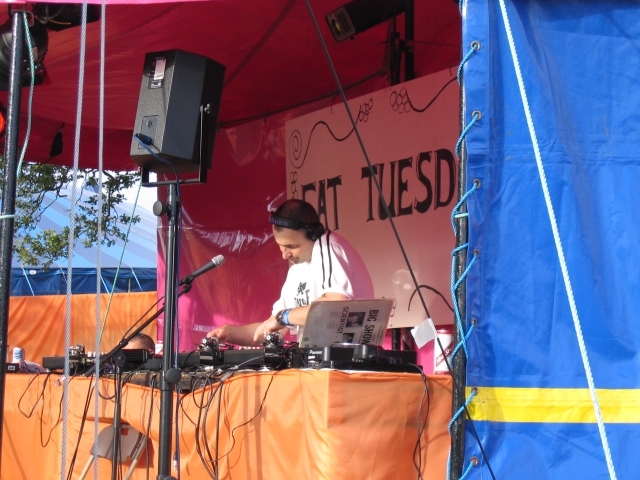 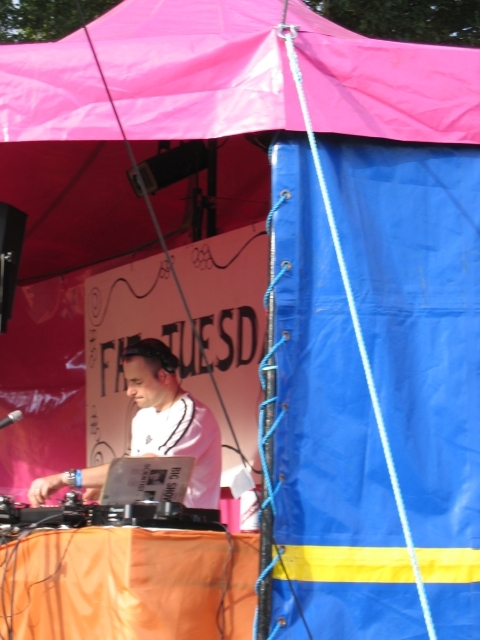 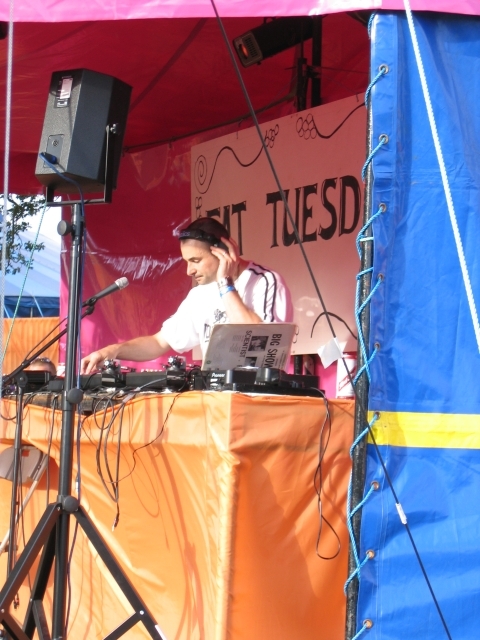 Andy Smith DJing at the Fat Tuesday Bar. 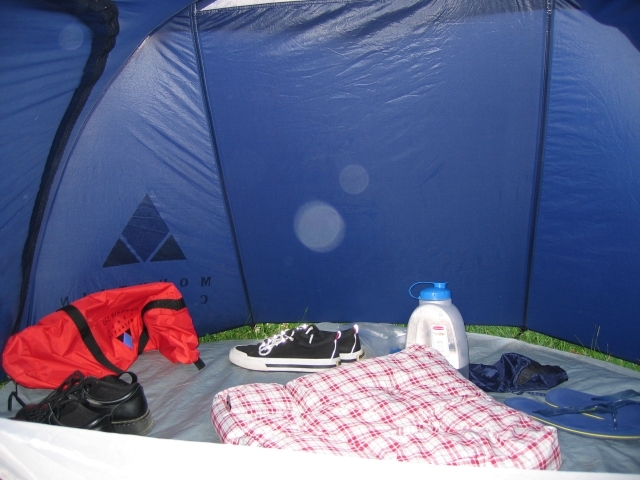 Porch area of Christine's tent, a fantastic spacious tent borrowed from The Only Michael of the project Animat. 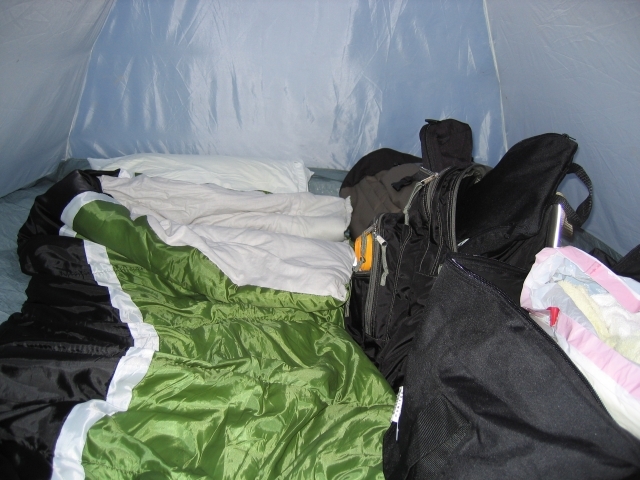 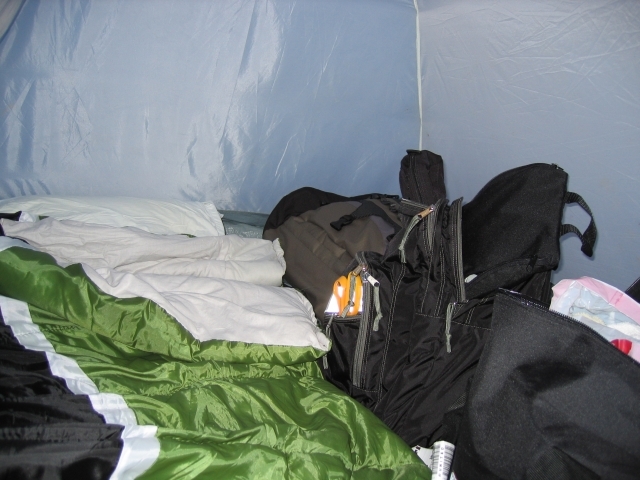 Interior of Christine's tent, again. 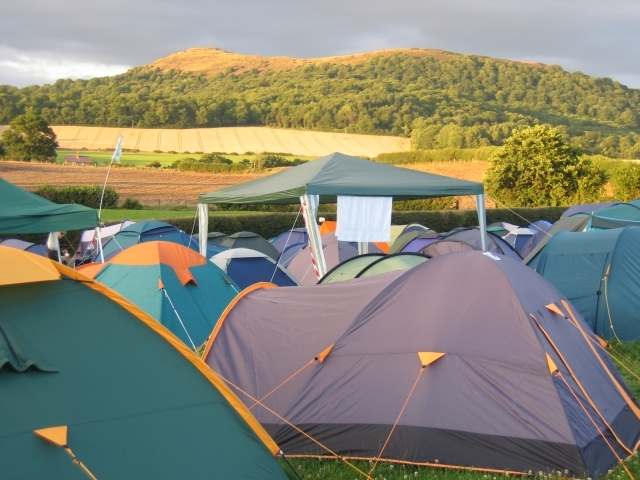 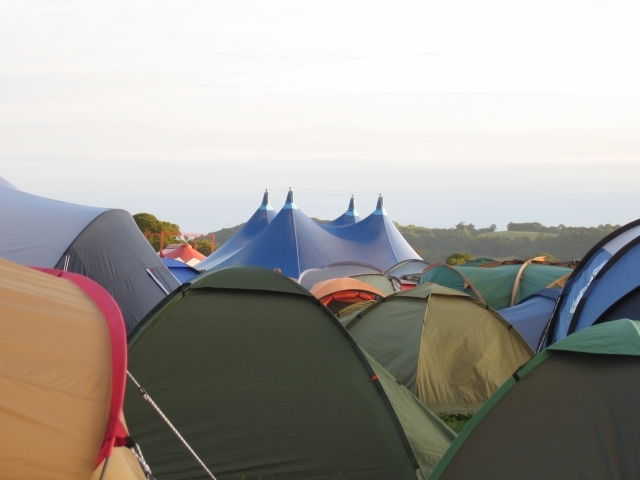 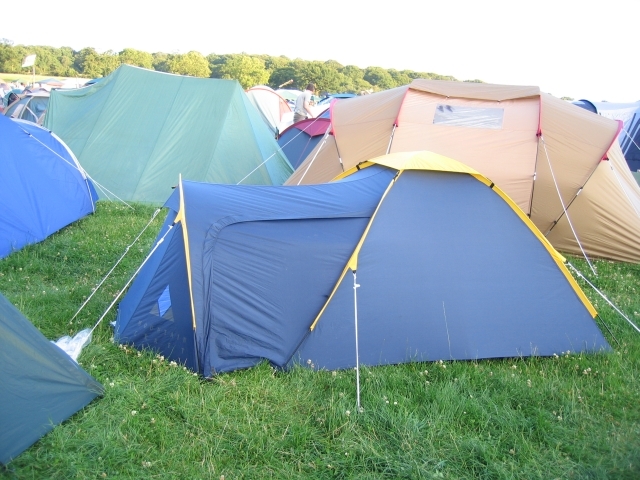 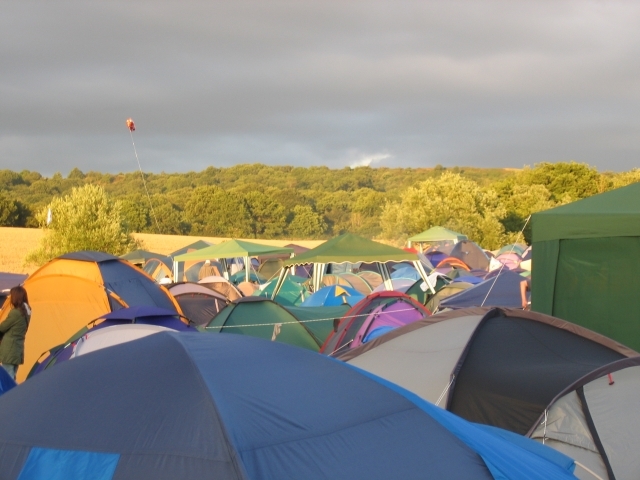 Neighboring tents and view of the hill beyond the camping area. 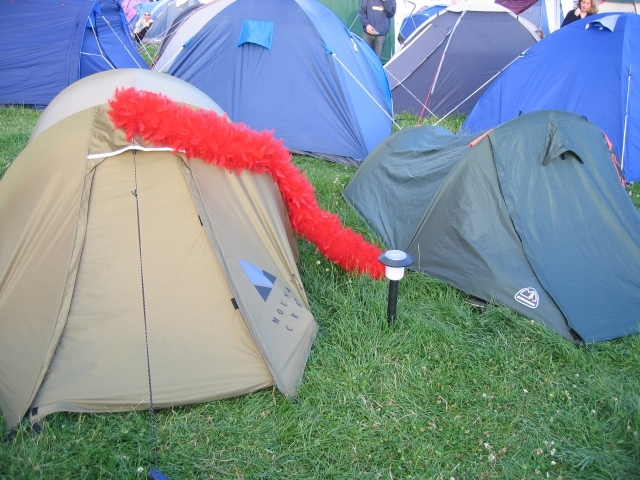 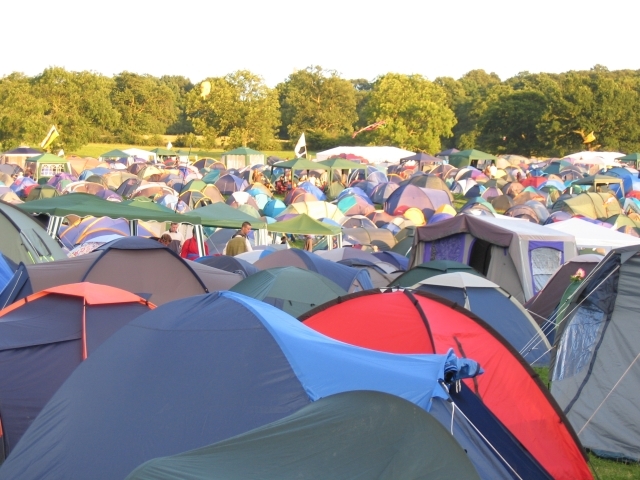 More tents, North General Camping. 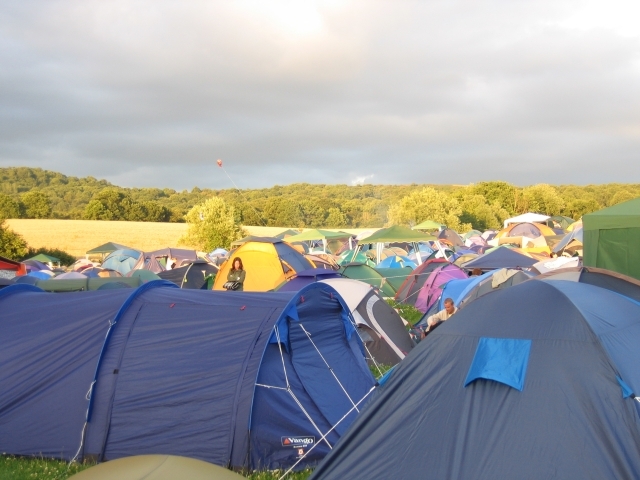 View of the Sanctuary Tent from North General Camping. 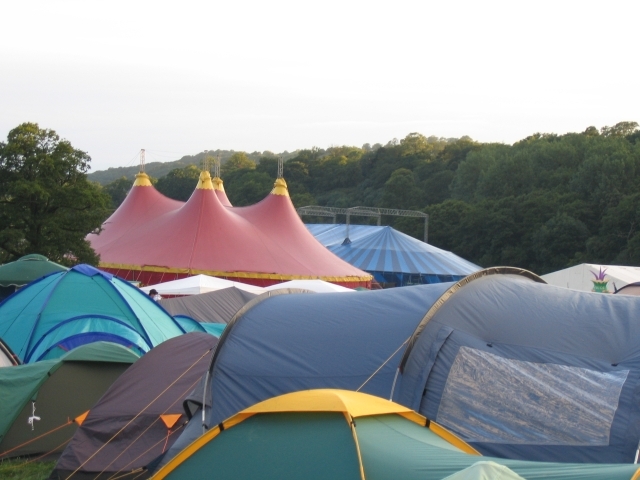 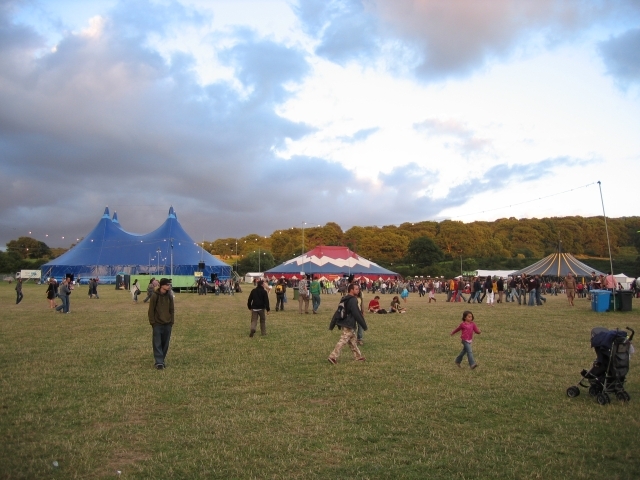 View of the Punchdrunk Tent and Club Tent from North General Camping. 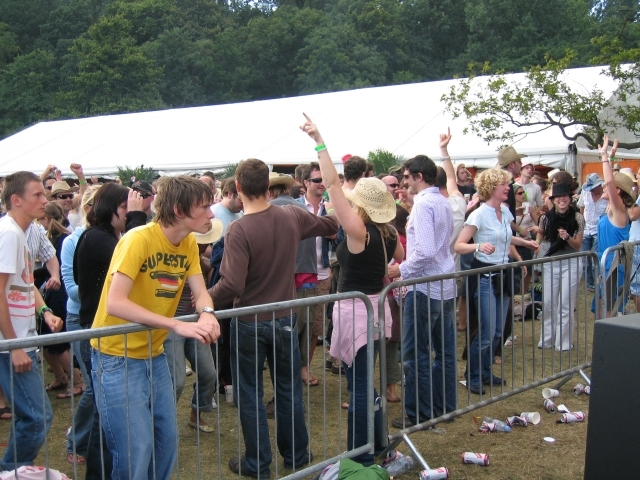 View of the Sanctuary Tent, Mediamix Tent, and the Strongbow Bar from in front of the Club Tent. 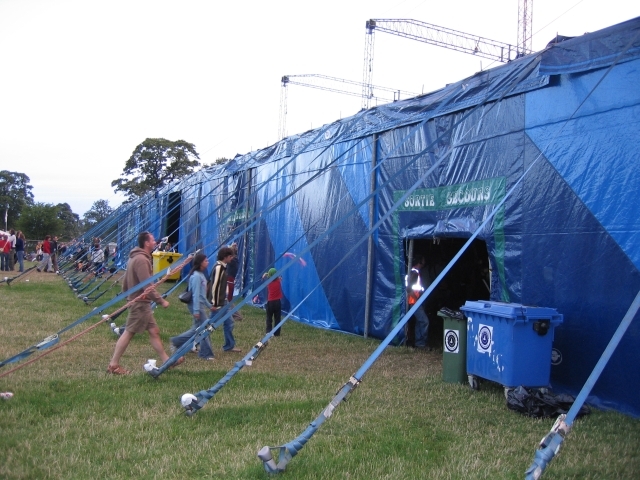 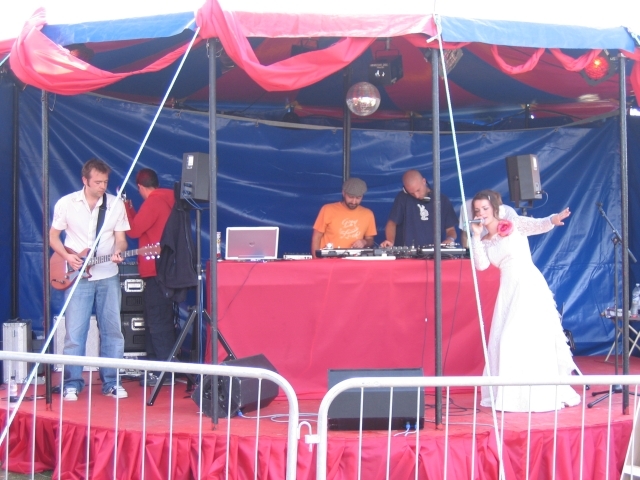 The Club Tent, a truly massive structure whose sheer size was hard to convey in a photo. 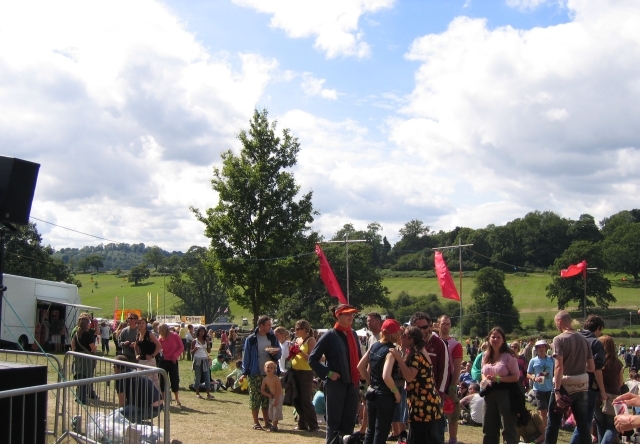 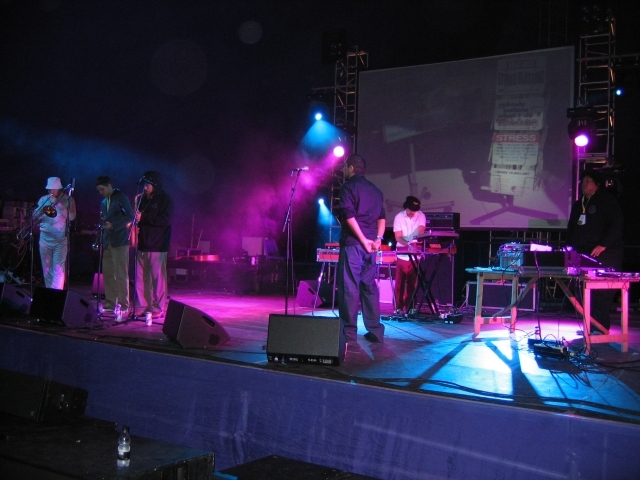 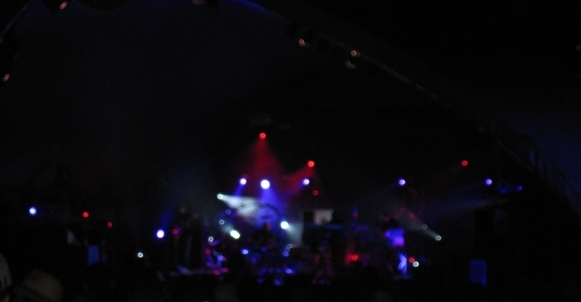 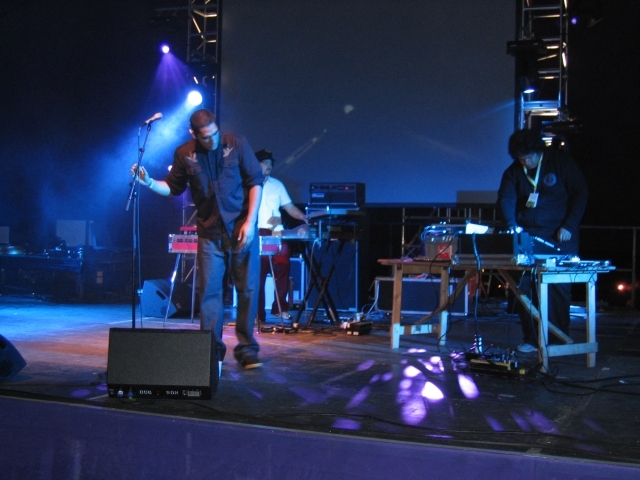 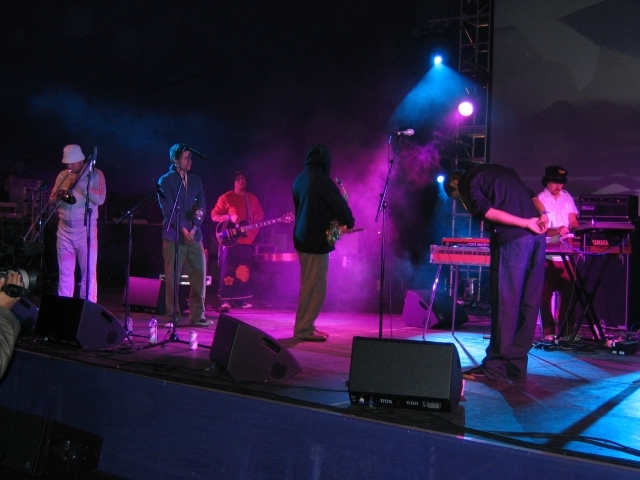 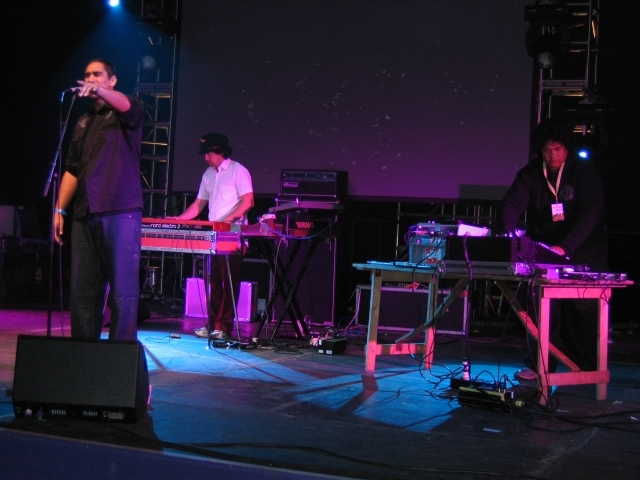 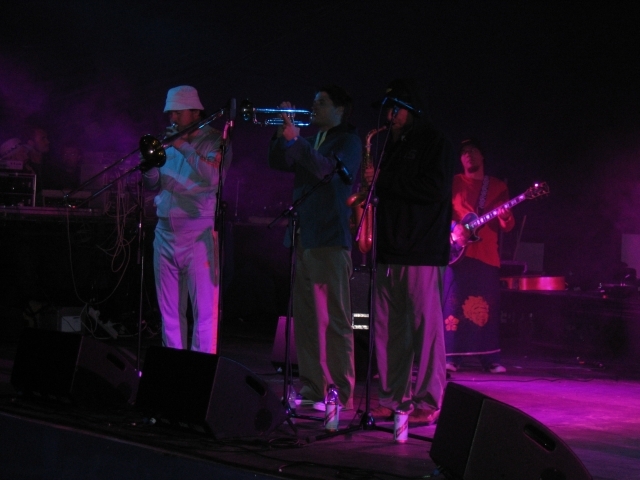 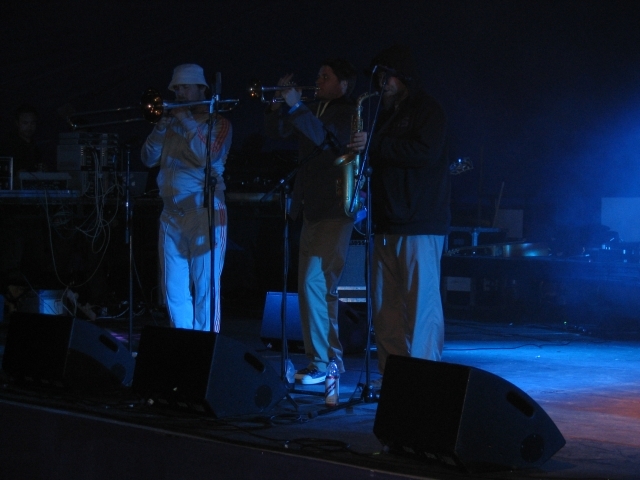 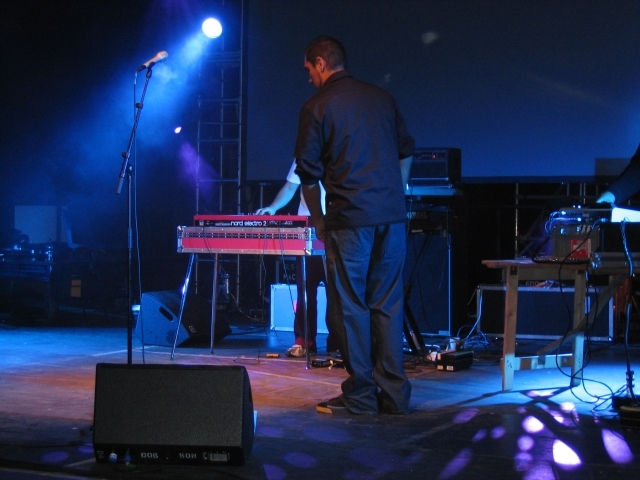 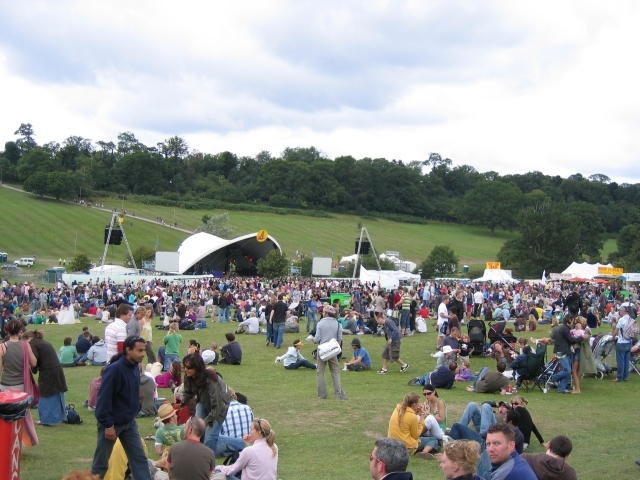 Fat Freddy's Drop performing on the Chill Stage. 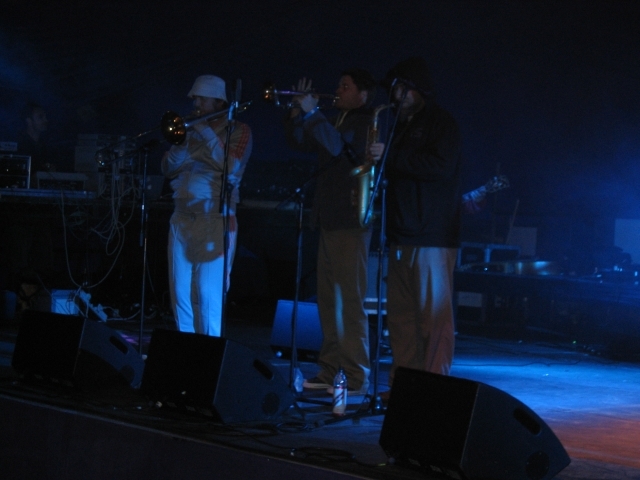 Fat Freddy's Drop horn section. 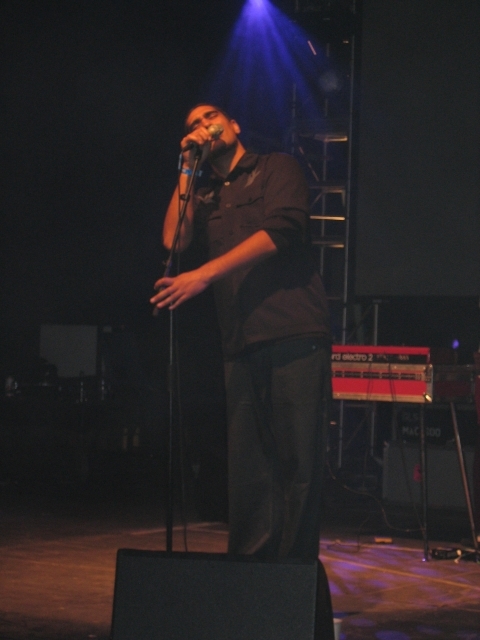 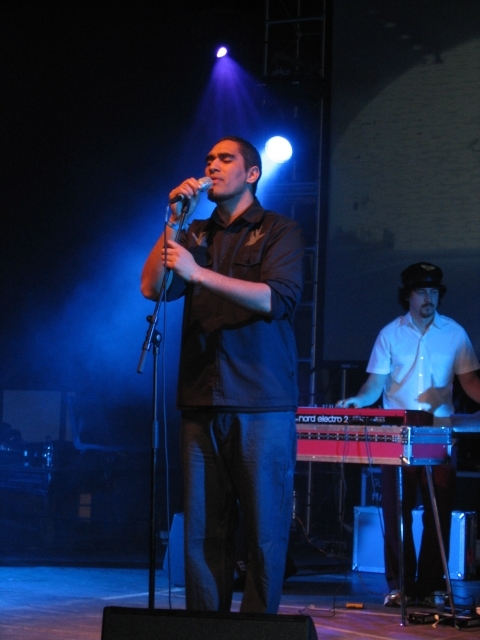 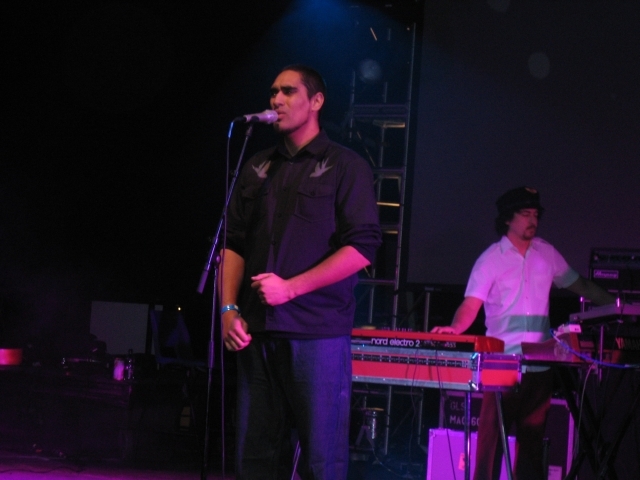 Fat Freddy's Drop vocalist Joe Dukie. 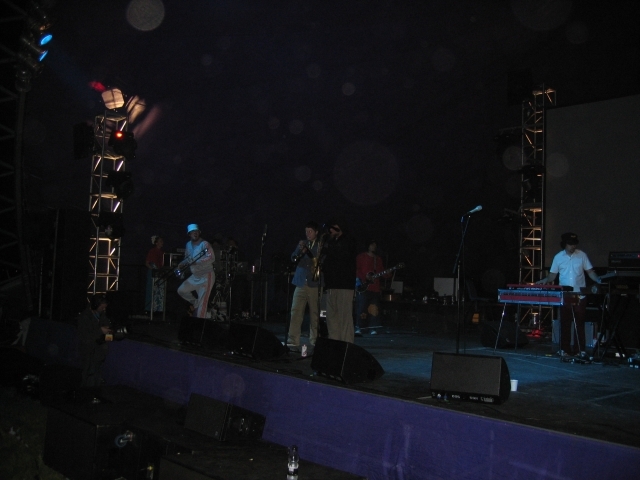 Joe Dukie dancing around the stage. 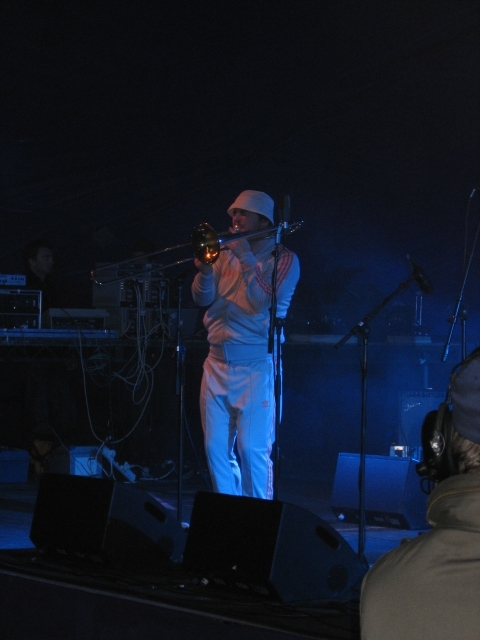 Fat Freddy's Drop's outrageous trombonist. 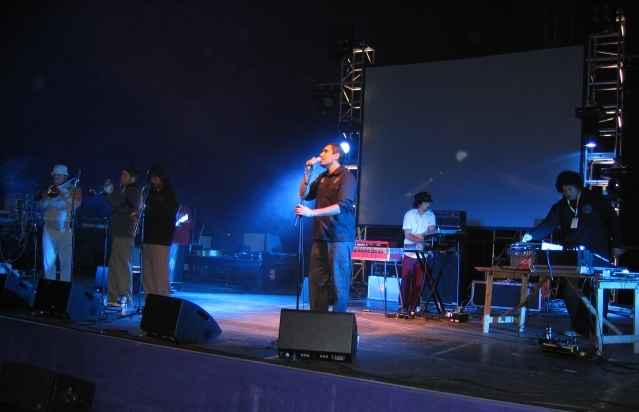 London Elektricity performing on the Open Air Stage.